The reaction from China followed official media here giving big play to Modi's speech at the World Economic Forum at Davos yesterday where he called protectionism "as dangerous as terrorism". A day after Prime Minister Narendra Modi’s speech at World Economic Forum in Davos, China today welcomed the IndianPM's address and vowed to work with India and other countries to strengthen globalisation process for the benefit of all countries. "I noticed that Prime Minister Modi made some remarks on protectionism and his remarks showed that globalisation is the trend of the times and serves the interests of all the countries including developing countries and the fight against protectionism and promoting globalisation," Chinese Foreign Ministry spokesperson Hua Chunying said. The reaction from China followed official media here giving big play to Modi's speech at the World Economic Forum at Davos yesterday where he called protectionism "as dangerous as terrorism". Some of the dailies like Global Times carried the photo of his address on the front pages. 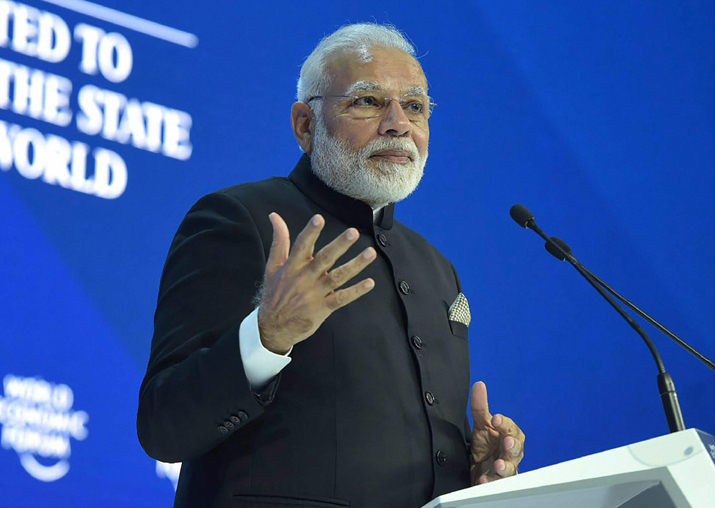 Modi, the first Indian PM to address the WEF Annual Summit in Davos in two decades, had talked about grave concerns facing the world, including terrorism and climate change. "Many countries are becoming inward focused and globalisation is shrinking and such tendencies can't be considered lesser risk than terrorism or climate change," he had said. One of the biggest beneficiaries of globalisation, China has emerged as emerged as the world's factory in the last three decades posting double-digit GDP growth rates for years while thriving on massive exports to all parts of the world. China is also firmly opposed to 'America First' policy of US President Donald Trump which was the main theme of Chinese President Xi Jinping's Davos speech last year. "China and India share a lot of common interests. China would like to enhance coordination and cooperation with all countries including India to steer the economic globalisation towards benefiting world economic growth and well-being of all countries," Hua said. Answering a question that Modi's speech "echoed" last year's speech by Xi at the same forum where he made a pitch for globalisation, Hua said Xi called for moving globalisation to a more open, inclusive, universal, balanced and win-win direction. Asked whether the common position of India and China in opposing protectionism could help improve strained bilateral ties, Hua said, "Our position is clear. India is a big neighbour of China. As the two largest developing countries and as two close neighbours, of course we hope that we can maintain steady development of bilateral relations. It serves the interests of our two sides." "We look forward to working with India to enhance our communication and our mutual trust, properly handle our differences and ensure sound and steady development of our bilateral ties. I believe this is the aspiration of the people of our countries," she said.